The H-CSR-M is a fully owned product of MHCi and its subsidiary CSRFi. It is based upon Michael Hopkins’ work on a CSR (Corporate Social Responsibility) conceptual model that Michael has been using, and steadily improving, over the past 20 years to assess the CSR/Sustainability of companies and institutions. More recently, he equates CSR to Sustainability now that both include the issue of materiality in their definitions (see below). 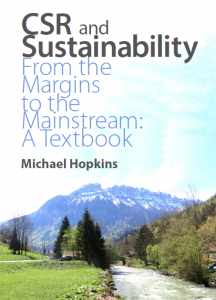 Dr Michael Hopkins’ last twenty years of investigation, experience, analysis and teaching have been included in his latest book – ‘CSR and Sustainability – From the Margins to the Mainstream: A Text Book (Greenleaf, UK, January, 2016). The Hopkins’ model itself is based upon the work of many authors albeit adapted to MHCi’s view of CSR shaped by 20 years of applying the main H-CSR-M concept in academia and business. Three main academic influences, as will be seen, were the work of Archie Carroll and his famous pyramid that we have adapted. Donna Wood and her model of Corporate Social Performance and the work of Ed Freeman on stakeholder dialogue. Our own model puts all these aforementioned contributions together, adapting them and applying them in practice. The model is a perfect way to assess the CSR of an institution or private company that can be accomplished very quickly. So what is the model? 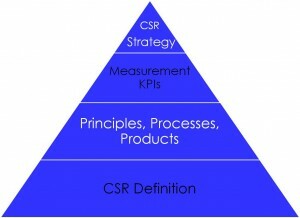 The basic framework of the model is illustrated in Figure 1 below and is composed essentially of CSR Definition, CSR Principle Processes and Products, CSR Measurement and CSR Strategy. CSR is a systems model to look at the social responsibility of all key stakeholders of an institution or company i.e. all aspects of a company or institution that contribute to its business or efficient operation are considered. We also insist that the business case for private companies’ use of CSR MUST be maintained i.e. profits must be targeted (or efficiency in the case of a non-private institution). Further, the model is not against profits per se, but HOW profits are made i.e. they must be made in a socially responsible manner. Thus the CSR systems model we describe consists of four main components – the CSR definition, which is the core of the model and from which the other components and detail emerge; a process to describe the main components of the model which are its principles, processes and products . Our model definition leads to a set of components, indicators and measures which allow the measurement of CSR with the Key Performance Indicators that allow one to assess progress and impact. The fourth main component is a 15 point strategy for any company or institution to follow. Like any model, the four points can be taken in the order I propose but its actual use will be used iteratively to ensure the best practical implementation. I shall look briefly at each element of the model next. Fuller details are given in our proprietory software available on request at enquiries@csrfi.com . Corporate Social Responsibility is a process that is concerned with treating the stakeholders of a company or institution ethically or in a responsible manner. ‘Ethically or responsible’ means treating key stakeholders in a manner deemed acceptable according to international norms. Social includes economic, financial and environmental responsibility. Stakeholders exist both within a firm or institution and outside and includes at least an organization’s leaders, staff, shareholders and suppliers as well as the consumers and users of their public goods and services. It will also include media, Government and the wider society. The wider aim of social responsibility is to create higher and higher standards of sustainable living, while preserving the profitability of the corporation or the integrity of the institution, for peoples both within and outside these entities. The key is how profits are made, not the pursuit of profits at any cost. CSR is a process to achieve sustainable development in societies. Both CSR and Sustainability address multi-stakeholders and their materiality. Thus CSR and Sustainability are interchangeable concepts. There must be a business case for working with stakeholders. These include the wider society and, as such, being a responsible company or institutions means working in partnership with society and being part of its long-term development. A good definition essentially defines the conceptual model from which all the elements can easily evolve. I de-construct the above definition in great detail in my text book, but I am confident in the above statement for a number of reasons. Note on Sustainable development. Sustainable development is development that meets the needs of the present without compromising the ability of future generations to meet their own needs as defined by the UN sponsored report on Our Common Future chaired by Gro Brundtland. See: http://www.un-documents.net/our-common-future.pdf accessed April 2 2015. Thus CSR, as defined above, aims to achieve sustainable development as its goal. I call this the 3-P model for the measurement of CSR…more details are available to club members or contact us via enquiries@csrfi.com . The CSP model, I now call part of the Hopkins CSR model, is used as a basis to develop a set of suggested indicators to measure corporate social responsibility profiles. As I have already noted there are three “layers” of the model and nine essential elements of measurement. The indicators suggested have been constructed within these elements and thereby offers a clear conceptual model from which ways to measure and compare outcomes in each element and collectively, impact outcomes of the total system. Our approach leads to man fewer indicators than normally found in frameworks, such as GRI for instance. Again, more details are available: contact us via enquiries@csrfi.com . What happens when these ideas are transformed into a strategic framework to enhance the competitive advantage of a company while preserving the values of CSR? Instigating a CSR programme simply on a “nice-to-do” or “wishful thinking” basis just won’t wash in today’s “goldfish bowl” business environment. CSR is not just the right thing to do; it has to be the right thing to do for your company or organization. Hence the first step is to identify and pin down the key business or organizational goals. Having done so, the purpose of a strategic CSR programme in terms of how it will align with and hopefully advance these goals can be clearly stated. Hopefully this will be self-evident to those who will have to sign off on the programme. As such, the aims and objectives of any CSR programme have to be aligned with the corporate or organizational goals and also be congruent with the corporate or organizational values. If not, they will simply bounce off and it will be back to square one! The H-CSR-M has such a strategy that has been applied in over 50 companies around the world. Based on the aforementioned experiences this strategy has been converted into 15 key steps in creating a corporate CSR strategy. Again, more details are available if you contact us via enquiries@csrfi.com . Small sized Business or Institution (less than 50 employees). Web document based analysis. Medium sized Business or Institution (51-500 employees). Web document based analysis. Large sized Business or Institution (501+ employees). Web document based analysis. Michael therefore uses the phrase ‘conceptual model’ to describe CSR. He also explains that CSR is a systems model to look at the social responsibility of all key stakeholders of an institution or company i.e. all aspects of a company or institution that contribute to its business or efficient operation are considered. He also insists that the business case for private companies’ use of CSR MUST be maintained i.e. profits must be targeted (or efficiency in the case of a non-private institution). Further, the model is not against profits per se, but HOW profits are made i.e. they must be made in a socially responsible manner. Major influences of Michael’s ideas have been the early academic pioneers of CSR in the USA – Archie Carroll, Donna Wood, Ed Freeman, Pat Werhane, Mitchell; then practitioners such as Anita Roddick, Adrian Payne, Simone de Colle, Al Straughan; UK Business Strategy guru Abby Ghobadian and last but not least my graduate students such as Nadine Hawa, Ms. Biernat, Jacques Bogh, Chris Cordey and Maga Ramasamy. Based upon Prof. Donna Woods work and the adaptation of which Michael calls the Hopkins-Wood model in his CSR text book.